FINAL SPACING: Plants should ultimately be from 6 to 10 inches apart. BLOOM/FRUIT: Purple flowers in spring and early summer followed by spiraling seed pods. 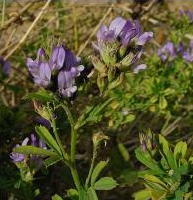 GROWTH HABITS/CULTURE: Alfalfa is a deep rooted legume with trifoliate (three leaflets) leaves. It is a cool season broadleaf perennial. PROBLEMS: Cotton root rot is a major concern. Blister beetles, and leaf hoppers, and aphids are sometimes pests. Use the Basic Organic Program, apply beneficial organism products and spray with Garrett Juice plus garlic. HARVEST/STORAGE: Best to eat the leaves fresh. Seed should be harvested when mature and store in glass. 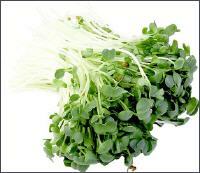 CULINARY USES: Leaves and sprouted seed are used in salads, on sandwiches and in health drinks. Leaves and seed are used in teas. MEDICINAL USES: Leaves of alfalfa are a commercial source of chlorophyll and have been used to reduce blood thinning on easy bleeders. They contain vitamin K and should not be used by those on blood thinners. Alfalfa is often taken to relive arthritis and other pains and is reported to stimulate appetite and aid the treatment of alcohol and drug addiction. LANDSCAPE USES: Winter ground cover for large areas. It is also an excellent nursery plant for beneficial insects. OTHER: Alfalfa is fed to horses, cattle and other livestock. It is said to increase mother’s milk. It is an excellent green manure crop and the seeds yield a yellow dye. There is some evidence that alfalfa may trigger lupus in sensitive individuals. 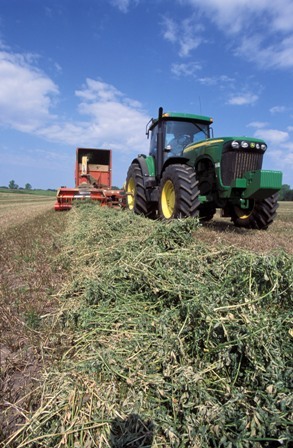 INSIGHT: Alfalfa can be grown in containers or even flats for the production of alfalfa sprouts. For the best germination and establishment of the nitrogen fixing nodules treat seed when planting with the proper rhizobia bacteria. Alfalfa is extremely deep rooted, one of the reasons it is rich in trace minerals.